Keansburg Amusement Park will celebrate its 111th Anniversary on Tuesday, September 1st from 10am to closing. The Keansburg Amusement Park will have special old time $1.11 pricing on select food, games and more and will offer unlimited kiddie rides from 10am-9pm for only $11.11 (kiddie rides only). 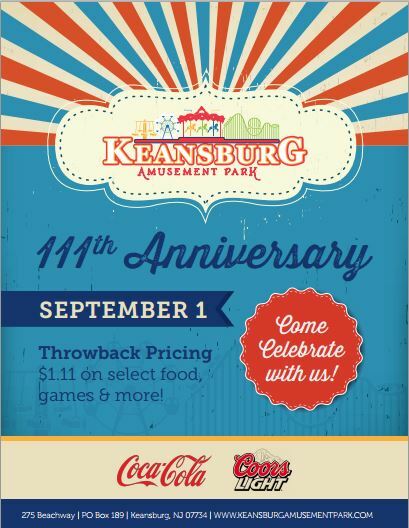 Keansburg Amusement Park will celebrate its 111th Anniversary on Tuesday, September 1st from 10am to closing. The Keansburg Amusement Park will have special old time $1.11 pricing on select food, games and more. Keansburg Amusement Park will offer unlimited kiddie rides from 10am-9pm for only $11.11 (kiddie rides only). Keansburg Amusement Park continues its 111 year tradition on the Jersey Shore. Originally developed in 1904 by William Gehlhaus as a summer destination of bungalows and a boardwalk. Over the years, William Gehlhaus and his investors formed what is known as the New Point Comfort Beach Company which offered steamship service from Manhattan to Keansburg, bringing thousands of vacationers to the Jersey Shore. In 1911, the Keansburg boardwalk added it’s first mechanical ride, a Ferris wheel. Today, the park is still owned by the Gehlhaus family and includes 40 rides, a waterpark, 8 eateries, games, arcades, go karts, fishing pier and batting cages. Keansburg Amusements and Runaway Rapids continues its 111 year tradition of offering family fun on the Jersey Shore. Park attractions include rides, water park, games, go karts, fishing pier, and food. Visit Keansburg Amusement Park’s website at www.keansburgamusementpark.com for more information on admission and group outings, and read our review of the Runaway Rapids waterpark.